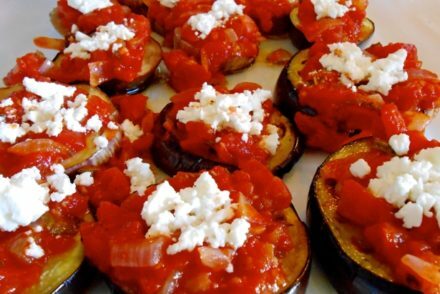 This dish is known to every Greek and it’s another comfort food we all grew up with. Tender chicken with a rich lemony sauce and bread to soak it all up, this was heaven. It is also easy to make. My mom remembers this being her very first dish she made once she got married and without a recipe. An inexperienced cook at the time, this was a foolproof recipe which my dad and our guests loved. While the traditional roasted chicken is the most common recipe, this one results in a moister chicken with the meat literally coming off the bone, plus it is very simple and requires little prep, no sautéing or marinating. By adding the potatoes with the chicken, they absorb the flavor of the chicken juices. You can also add carrots or sweet potatoes. Now these potatoes will obviously not be the crispy kind, but the soft type that have soaked all the juice. It is often made with rice as well. When I make it, the potatoes are usually first to go, so I make rice the next day and serve it with the leftover sauce. Now you may consider making this with skinless boneless chicken breasts, but I wouldn’t. 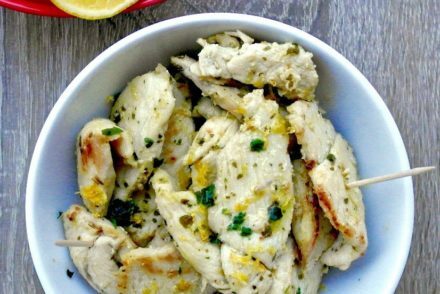 As the sauce resulting from the chicken, olive oil and lemon is important here, you will not get the flavor (and also the fat) using skinless meat. After it is cooked, the skin is soft and I remove it as I do not like the texture, and you can too, so you will not be eating it, but you do need that fat and flavor for the sauce. This sauce is in my opinion the best part of the meal, I could easily eat 5 slices of bread just by dipping in the sauce (but I won’t as much as I would like to). 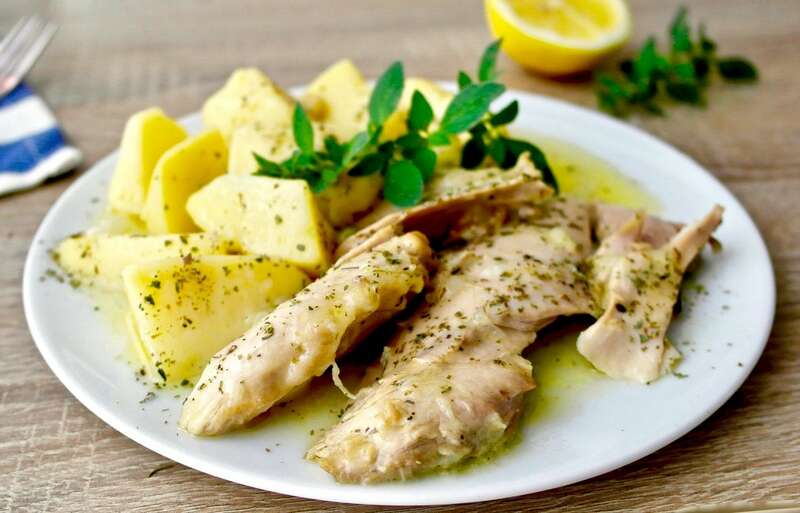 As is traditional in Greek cuisine, meats are often cooked with the holy trinity of Greek cuisine as I like to call them: lemon, olive oil and oregano. 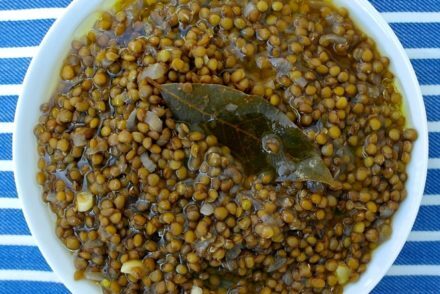 These three ingredients obviously make everything taste good, but they also impart a good dose of antioxidants as all three ingredients are excellent sources of these protective substances. You may serve pieces as is or remove skin and cut in pieces. Place the chicken in a pot and add the olive oil over medium heat. Add the onion, garlic, bay leaf, salt and pepper and mix it with a spoon. Add the vinegar and then add enough warm water to cover the chicken halfway (you can always add more later). Simmer the chicken for about 45 minutes and then add the potatoes spreading among the pieces of chicken. Continue to cook for another 15-20 minutes until potatoes are soft. You may need to add a bit more water, but do not add too much otherwise your sauce will be watery. When potatoes are done add the lemon juice and oregano and mix well. Serve with the sauce drizzled on top of meat and potatoes. What a nice story Linda, thanks for sharing! Thanks for this very tasty recipe! I made it for lunch today. Though I’m not sure about the vinegar. Could have been the one I used- a bit too sour sharp taste- next time I’ll want to try it with just lemon juice instead and may be some white wine? Or would this be unacceptable;-)? And was I right to add the garlic to the pot with the onion and other ingredients in the beginning? I’ve told my friends who love to cook how great your site is and I hope you will continue it for a very long time! Thank you Hannekke! Yes, you just add the onion and garlic at the same time. You can definitely use wine instead. I couldn’t wait to make this, and I am SO glad I did! After supper, I told my husband that I liked this so much, I think I could eat it every single week! I made only minor changes in the recipe – I sliced the onions rather than quartering them. And 2 T of lemon juice, rather than the juice of 2 whole lemons, was enough for me. I did like the dark meat better than the white meat; both were delicious, and you could use whatever chicken pieces you like! DELICIOUS!!! Thank you Nancy! yes, some prefer less lemon, depends on your preference for the lemony -tart taste. This was greatly enjoyed by the whole family, thank you! This sounds delicious. But it seems odd that the dried oregano is added at the last minute and not cooked with the chicken. It that a typo? The oregano (like the lemon) are added towards the end to maintain the flavor. Other recipes put the lemon juice and oregano with all other ingredients at once, then cooked until finished. Does it make any difference? By adding the lemon juice at the end you maintain the intensity, if you prefer a less lemony taste than you would add it earlier. Hello I’ve rede so much about olive oil I’m not sure which is the best on the market or which one is pure at the grocery store. Is there a brand that you would purchase from the grocery store? Looks yummy! Would you traditionally serve this will a salad? or cooked veggies? Doesn’t provide many vegetables as a whole meal. Thanks! Yes, this is served traditionally with a salad. I made this for dinner and it was delicious. Like another commenter, I was a bit skeptical about adding an entire tablespoon of oregano at the very end, but I did and it tasted great. I served it with a nice salad. hanks for yet another great recipe. I made this and it was delicious! I wanted to tell you how much I enjoy your website and recipes. I’ve been pulling recipes from here every week since I discovered the site this winter. Thank you for these interesting articles and great recipes! Thank you Sandra! I really appreciate it! Is this cooked in a covered, or open pot? Hi Dennis, yes it is covered. What a delicious & healthy recipe. I love lemon & find it to be a wonderful balance & aid to digestion of animal fat & protein. And olive is recognized as a good fat that helps balance cholesterol levels & ratios of good & bad. I put fresh squeezed lemon on almost anything I eat. And I also throw into the pot a half of organic lemon with the skin to get the benefits & flavors from the lemon oils. Same with oregano, cook some in the pot & add more when it is done. All these delicious flavors allows us to reduce added salt. Thank you for your inspiration & delicious recipes. Thanks Stathi! Yes so true! the herbs and and other seasoning not only add flavor and we don’t need so much salt. I made this for dinner and my family loved it. I used my Instant Pot (electric pressure cooker) to cook the chicken for 20 minutes, followed by a natural release. Then I pulled out the inner pot, added the veggies and simmered them in the inner pot on the stove top. We halved the quantity f oregano because we felt that the flavor overwhelmed the chicken. The sauce was fabulous (as you promised) and we polished off a big loaf of crusty loaf of Portuguese corn bread dipping and dipping. Yum! Thanks for sharing Christine! Sounds delicious!